A nonprofit organization, working in partnership with the Co-Cathedral of St. John the Evangelist in Rochester, MN and the people of South Sudan, dedicated to the education of the children of Pukuka, Yei, South Sudan, with a focus on the development of educational opportunities emphasizing Catholic values, academic success and access to improved health care. 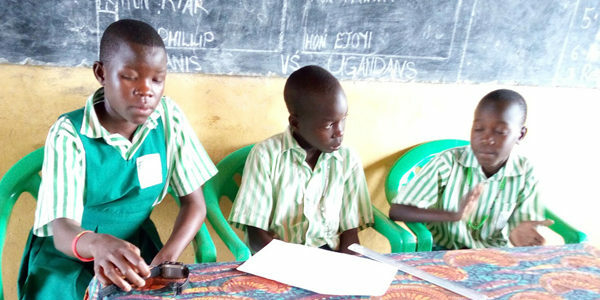 Debate teams are very important in both South Sudan and Uganda. The debate teams met every Friday afternoon and it was considered quite an honor to be selected to be on a team. Winie has a unique talent for drawing and wanted to share some of her pictures with all of you. 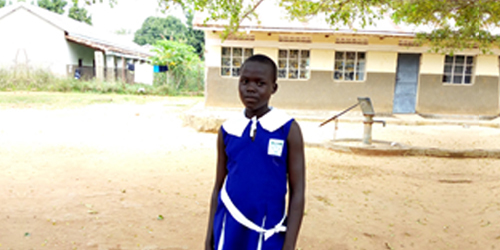 She is very thankful for the sponsorships and the opportunity to attend school while being away from her home country. Joyce was a leader and an excellent student at St. John the Evangelist School in Pukuka. When the war started, she and her siblings were sent to the refugee camp on their own, with no adult to accompany them. Despite their slower academic progress, the teachers have noted that the girls are highly disciplined, very loving and interact with other children in an extremely positive way. It is expected that they will continue to improve and be able to catch up to the appropriate grade and age level. This week we would like to introduce Samuel George and Ruta Kamala who are shown working with their teacher at St. Kizito Catholic School in Arua, Uganda. These three boys have exhibited exceptional performance in all of their subjects and lead the class in every way. They proudly say that they have confidence and they aim at excellent performance. Patience is an example of the adaptability of the children in learning new languages and adjusting to a new culture while attending school. Patience is first in her class despite the language barrier and has adapted well to this completely new environment. Her future continues to look bright and brings her hope and a lovely smile! Jido is the class prefect/leader of primary one. One of his strong characteristics is his excellent diction and his ability to articulate clearly. This helps him provide great leadership for all students in the classroom. Tiyo is a very social, yet disciplined girl. She concentrates on reading books. She likes to help other students learn. She encourages her classmates, especially those who struggle. Tiyo does a great job of helping other students cope with learning difficulties.